Welcome to another year of Thirty One Days of CCS! Every day this month, I will review the output of students and alumni from the Center for Cartoon Studies in White River Junction, Vermont. I've been covering the comics and creators who've attended this school focusing entirely on comics education since close to its beginning back in 2005, and I've seen a lot of remarkable talents grow. The CCS ethos is to publish and get better in public, and so hundreds of minicomics have poured out of the school during that time. Let's see what's up with old favorites and new artists. 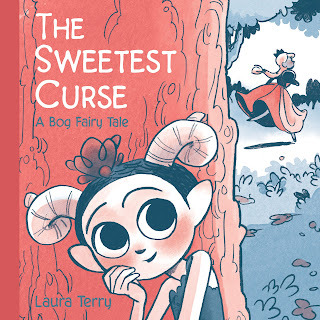 The Sweetest Curse, by Laura Terry. Terry had a big success with last year's Graveyard Shakes, and she'll be publishing Adorable Empire for them next. I reviewed the first couple of chapters of that in mini form last year. Her entry this year is a short, complete story that once again works in the fantasy milieu while subverting it. This time around, it's about a Bog Fairy, who are supposed to curse humans. The story follows a nice Bog Fairy who can't quite get the hang of cursing other creatures, doing things like turning a bush into a nice kitty. She takes abuse from bully fairies and gets mocked by a Fairy Princess. Terry neatly turns that conflict around and turns it into a sweet romance, as the Princess had a crush on the Bog Fairy, and the end sees them cursing bullies and having a grand old time of it. Terry's character design and line are both impeccable and irresistible. Her use of gesture and body language sells every aspect of the story, with a style that's wildly expressive while looking clean and precise. It's a great formula, because it gives her a template with which she can subvert expectations. Hopefully, she'll continue to return to this setting, because it seems fully-formed and capable of bearing a number of different stories. 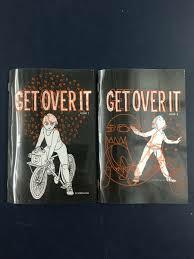 Get Over It, by Mary Shyne. This is an extended version of a mini I read earlier that happened to be part of Shyne's senior thesis at CCS last year. The high concept for this comic is brilliant, as it's about a young woman who can see the emotional projection of each person, which takes the form of a creature of some kind. For those whose "emotional miasmas" have been damaged, they manifest as monstrous forms. The main character, Leigh, is a bit directionless as we start the story, acting as a bike delivery service for her father's restaurant. When she delivers food to a lab and puts on some equipment, it becomes obvious that others know about what she can see, and the equipment acts as armor. Putting it on allows her to literally fight trauma by getting it to become corporeal and punching it. The red ink she uses for the miasmas flatters her thin, careful line, giving her entire presentation a liveliness that just doesn't quit. Shyne barely scratched the surface of her narrative in this tantalizing excerpt, yet she left the reader with a fully-formed main character that was easy to root for. Shyne really succeeded here because she clearly understands the mechanics and pacing of how fights and action work. 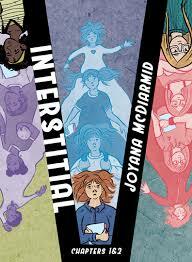 Interstitial, by Joyana McDiarmid. McDiarmid's Long Division series (and hopefully upcoming book) was one of the best of the CCS projects that have been completed. She's certainly deserving of wider recognition. Interstitial sees her plunge into a new project, about three different young women who have been strongly influenced by a particular book of poetry. Elise and Quinn, in the present day, are lovers. Elise is in college and Hanna works there. Elise is friends with a third young woman, Hanna, who is also in college. At the beginning of the story, all three are in a very good place, as Hanna learns that she's going to be helping as a TA. The story starts with Quinn seeming to fracture across time as she looks out a window, from various ages of her life, and the rest of the chapter is simply set-up and introductions. The second chapter winds back and starts to establish the actual story, as we look into the pasts of each of them. Hanna's part of a family where she's the second oldest and already a mother figure, thanks in part to an indolent older sister. Elise is neglected by her father in favor of her younger brothers. Quinn's in a turbulent relationship with a man, goes out dancing to spite him, and he tells her not to come home. The point of each of these flashbacks is to show them as unhappy here as they were satisfied in the first chapter. We get hints that that book of poetry, little poems for little girls, has some kind of transformative quality. Hints and pieces are all that McDiarmid reveals in this first issue, but there's a lot to think about here. Her character design is superb, as always. She draws bodies that look like real bodies, for one thing. Her use of gesture is a key aspect of the comic. The art isn't quite as elegant or intricate as her prior series, but it's obvious that she's going for a different, more cartoonist style here because the story's ultimate tone will be quite different.